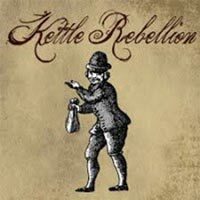 Kettle Rebellion was the band between The Orphans and Mischief Brew. They were a short-lived power trio based out of a West Philly basement that played what could best be described as "Hobbit Punk." It's medieval/Celtic/pirate/Goblin-toned music, with over-the-top Tolkien inspired lyrics... if "Lord Of The Rings" had an anarchist bent, climactically aiming to overthrow modern corporate feudalism. This album was stolen from Erik & Denise's house in 2004, bootlegged, recovered, mastered, and now here it is! Bronze vinyl.